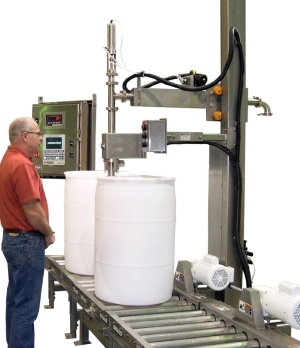 The liquid food industry requires more than a simple drum filling system. In this case, sanitary conditions are required, because avoiding contamination is the highest priority on a production line filling one 55 gallon drum every minute, 16 hours a day. This is a food grade, semi-automatic single drum filling application where the operator is available to align the bung opening to the filling lance and to place bungs and caps onto drums after they’re filled. The standard food grade filler at Specialty Equipment Company begins with a rugged, all-stainless steel welded frame construction, the strongest in the industry. The 100lb capacity load cell scale base, along with the infeed and discharge air-lines, all the bearings and the unions also meet sanitary requirements to be washed-down daily. In addition, every filling machine, whether it is a single drum or palletized drum filler, is capable of either top or sub-surface filling, another unique feature of Specialty fillers. Other manufactured and assembled components include; a 316L stainless-steel lance with two infeed ball valves, another unique feature with Specialty. Tri-clover tubing with quick disconnects, couplings and seals are used to meet sanitary conditions. If an operator platform is required, Specialty provides either a stainless-steel platform, or a fiberglass platform for washdown applications. Food grade fillers can be made to accommodate dairy conditions as well. All stainless steel roller conveyors with floor supports welded to the frames creates a one-piece superstructure, the strongest in the industry. Washdown duty motors and gear reducers are included with each powered conveyor. In addition, conveyor rollers have PVC perimeter rings and safety cover splash guards to prevent the spread of contamination during washdown. This feature is only provided with Specialty Equipment conveyors. Gravity roller conveyors accumulate and feed the empty poly drums to the filler and also accumulate filled drums after the bunging operation. One powered conveyor is mounted on the filler scale and another is floor-mounted, adjacent to it to stop each drum for bung and capping. A standard, Allen Bradley PLC controller with an operator touchscreen is also part of every filler package. All the equipment was built and tested at the Specialty Equipment plant in Houston, Texas. If the customer was not available to witness the test, a certified video of the testing process was provided.